Angel Row has seen better days. Sinatra’s is now long gone leaving both empty unit and bare pavement, next door, The Olive Tree café has recently closed too. Marrakesh was the last bastion of decent food (ok Las Iguanas isn’t terrible but £16.25 for chicken fajitas is outrageous… Fat Cats makes it look good though). Ask was another to shut its doors but we haven’t had to wait to long for new tenants. Sushimania have 8 locations across the UK, Nottingham the latest addition to the bunch. 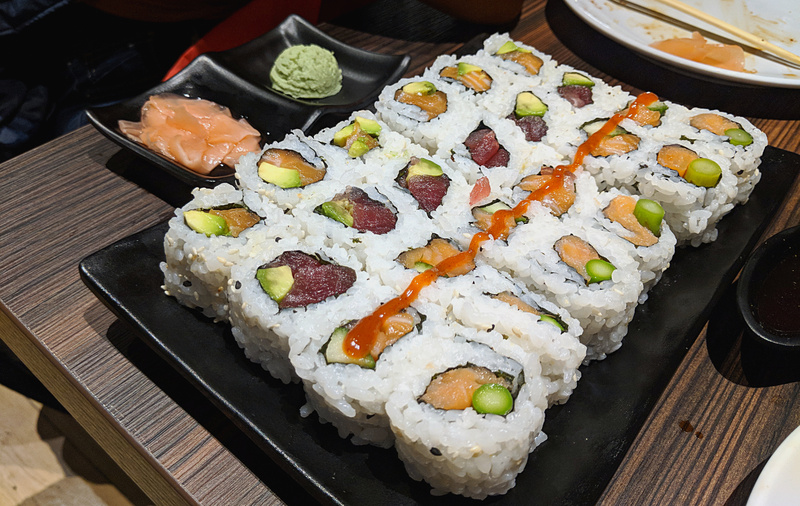 Their offering of all you can eat sushi has turned a few heads – one needs a USP these days with high street restaurants going bust left, right and centre. If you remember visiting Ask previously the layout remains similar. It is quite unique with a bar area as you enter, at the moment this doesn’t appear utilised as we were greeted by partially opened boxes. Stairs take you to a mezzanine level which leads on to an open kitchen and around to a surprisingly big area of more tables. We were at the front which was nice as the further you go any natural lighting is lost. Their full menu is fairly extensive, though I only gave it a cursory glace. I was here for the all you can eat. Choosing to go down that route limits your options a little, many of the higher tariff items have supplements or restrictions. Despite that there is still plenty of choice and the menu includes many of the Japanese restaurant staples as well as sushi. I won’t go into a lot of detail as much of what we had was similar, variations on tuna and salmon rolls mostly. The first thing I will say is that the quality of the fish was good and that goes quite a long way to enjoyable food at a sushi restaurant. The quality of the rolling was a little more questionable however, I’ve rolled my own sushi and think I was about as neat as some of these. It doesn’t affect the flavour of course, but disappointing for a specialist establishment. Hot food was a mixed bag by comparison. Tempura vegetables were the best of the bunch, the batter really very light, the prawn version of the dish was woefully underseasoned. 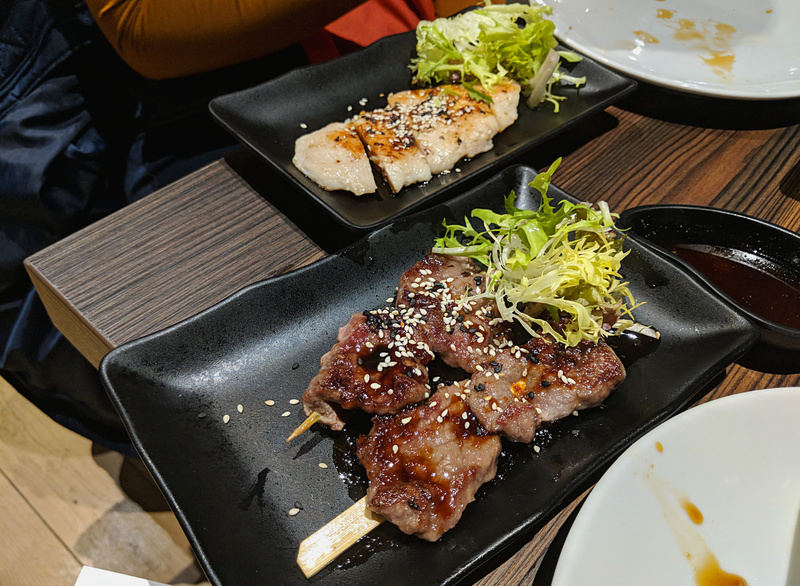 Some teriyaki chicken skewers were the biggest disappointment, there wasn’t enough of the sauce, nor was the meat of good quality. We didn’t eat any of the items that demanded a supplement (it seems counter intuitive unless there is something you particularly want with so many other options available). We did meet our quota of salmon sashimi, I think it was only 3 you could order but I would recommend maxing out on it if you go! There is a surprisingly large amount of competition for Sushi in Nottingham. Yo! as the big high street brand and then Bonzai & Manga Sushi in the city centre as well as the charming Higoi in Lenton. All of those are very capable restaurants that I have visited on multiple occasions. So where does Sushimania fit in? 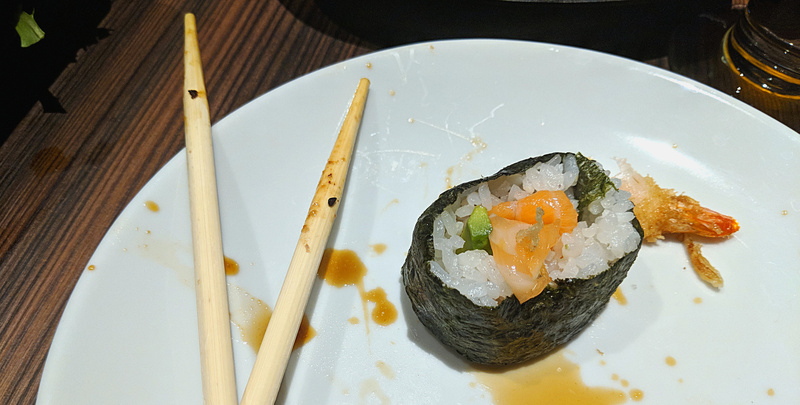 The main thing it has going for it is the all you can eat offer, I admit to piling up plates of sushi with no thought as to the impending cost. If you have the deal it is £19/20 (advertised at £16.80 but non-discretionary service charge after any drinks you have had too) and you can definitely get your money’s worth, despite there technically being a limit of 1.45 hours per table. We went on a Tuesday night and there was no sign of being kicked out as we approached the 2 hour mark. Credit to the staff too, it would be easy not to make sure this was right given the nature of the restaurant but they were friendly and efficient. The main problem is that outside of the aforementioned deal I struggle to see Sushimania differentiating itself. Perhaps that means it doesn’t need to.